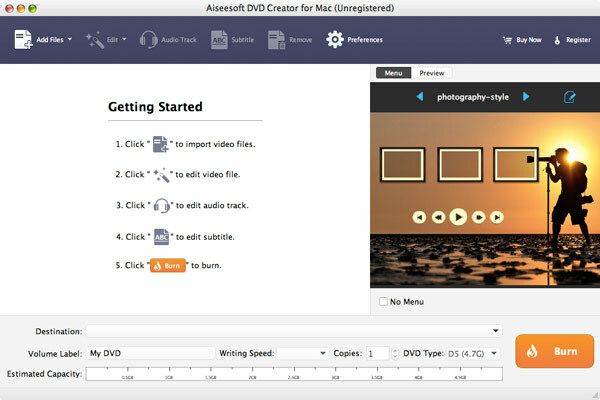 The all-featured DVD Software Toolkit for Mac enables you to easily create DVD disc, convert video/audio formats, play Blu-ray disc, convert 2D to 3D, transfer iPhone/iPad files to Mac and more. DVD Software Toolkit for Mac is the best toolkit to help you convert video formats, play Blu-ray disc, create DVD disc, transfer iOS data, convert 2D to 3D, and more on Mac. Convert homemade DVD and video to any frequently-used video and audio format with fast converting speed and high quality. Transfer all types of iOS files like SMS, contacts, photos, songs, etc. between iPhone and Mac. Play Blu-ray disc, Blu-ray folder and ISO files smoothly on Mac, and give you the fantastic visual experience. Convert homemade DVDs, videos and audios to any format for better playback on your portable iOS/Android device and media player. It highly supports any popular video/audio format like MOV, MP4, AVI, FLV, MKV, WMV, RMVB, M4A, M4R, MP3, AAC, FLAC, WMA, etc. No matter which format you want, the conversion will be complete within only a few clicks. Whether it's 2D to 3D conversion, 3D to 2D conversion, or conversion between different 3D modes, it will always do the best for you. What you need to do is just select the 3D or 2D format and click the Convert button. The built-in DVD authoring software lets you make creative DVDs from video files downloaded from online sites, or taken by your camcorder, phone and other devices. While burning videos to DVD, you are allowed to add, edit and delete subtitles, audio tracks and DVD menu. So you can preserve every wonderful moment in DVDs with ease. Blu-ray discs bring you excellent picture quality and crisp audio effect. Blu-ray Player for Mac gives you splendid Blu-ray enjoyment. It can play Blu-ray disc, Blu-ray folder or ISO files on Mac. In addition, it is able to play video files in MP4 and other popular SD or HD (including 1080p) video formats. 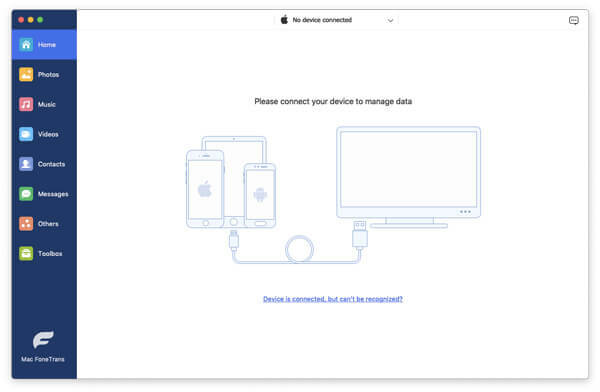 The built-in Mac FoneTrans offers the perfect solution to you for sharing all of your files between iOS device and Mac, and between different iOS devices. It can import music, video, ePub, PDF and image files on Mac to iPhone directly, and transfer music, movie, pictures, TV shows, podcast, iTunes U, eBooks, SMS, contacts and more from iPhone to iTunes and Mac. Also, it's very easy to back up iPhone SMS/MMS and contacts. Extract audio track from DVD/video and convert it to frequently-used lossless audio in FLAC, WAV or WMA or regular MP3 format. This advanced acceleration technique guarantees you a super-fast conversion speed. Moreover, it keeps the high output quality. Free download, install and launch this powerful DVD Software Toolkit on your Mac. It consists of five professional software. 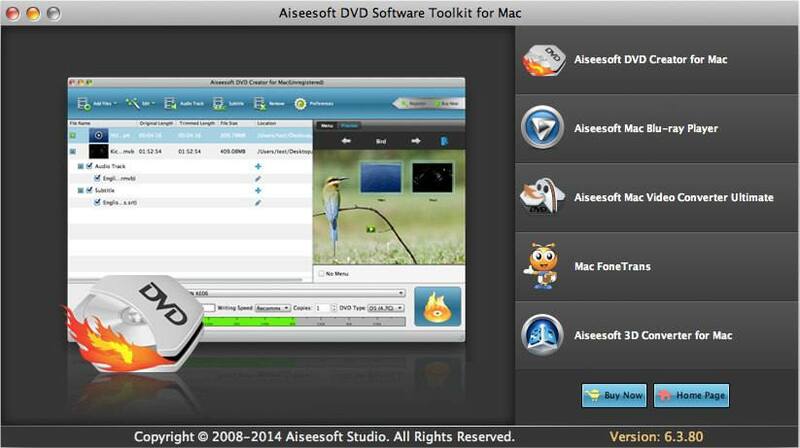 Click "Aiseesoft DVD Creator for Mac" to burn DVD discs, DVD folders and DVD ISO image files. 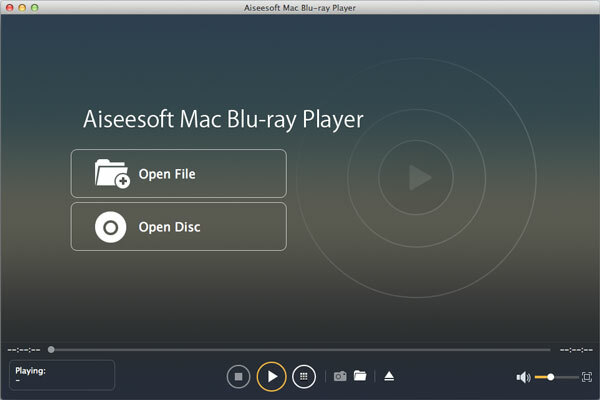 Click "Aiseesoft Mac Blu-ray Player" to play any Blu-ray movie or video in disc/ISO file/folder on Mac. Click "Mac Video Converter Ultimate" to convert video/audio formats, eidt video, enhance video quality and more. Click "Mac FoneTrans" to transfer all types of iOS files like contacts, pictures, videos, audio, etc. between iPhone/iPad/iPod and Mac. 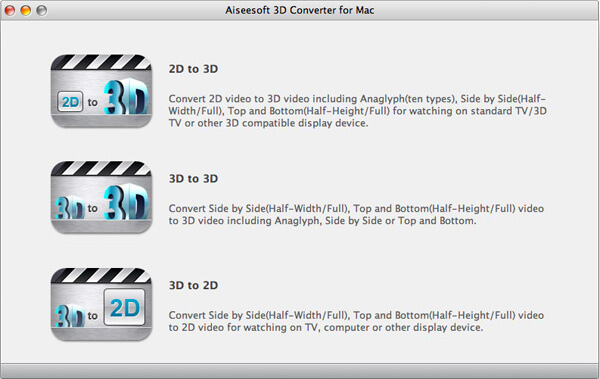 Choose "3D Converter for Mac" to add 3D effects to regular 2D videos to get fantastic visual experience, or convert 3D movie to 2D video. This DVD software toolkit for Mac is very helpful. I use it to convert video formats and turn 2D video into 3D movie. I can easily do it with just a few clicks. I purchase this app toolkit mainly for the Blu-ray playing and video converting function. I use it to play my Blu-ray disc and convert video to my needed video/audio format. It works very well. I like to download online videos, but often get some unsupported video formats. And this powerful toolkit do me a great favor. Now I can easily convert online videos to the suitable formats I need. Easy to use! The video converter is very useful. What's more, the iPhone data transfer also helps me a lot. It is definitely easier to use than iTunes. Convert, create, play, and record Blu-ray video and common video on computer.